What are your dreaming of? Show us any of your artistic versions of your dreams and to show you some inspiration, follow along with these inspirations from our design team. Hi everyone!!! Are you ready for the May Challenge on the Emerald Creek Dare Blog!! This month it is about "Dreams"...we all have dreams. Some good and some not so much! Butterflies always remind me of great dreams...I can watch them as they are flying around in the garden just enjoying life...looking for the next flower and searching for the next flight! It makes me dream of fairies that might be flying along with them sprinkling pixy dust in flight! Dreams don't have to be so big that you can never achieve them. Poor Sheena has big hair like mine. My hair isn't green though. While fantasy creations aren't usually within my comfort zone, I had so much fun creating my Fairy Garden Dream mixed media plaque with the help of Kelly Klapstein's Dream Phrase stamp set, Nicole Wright Designs Fallen Blossom stamp, the Chrysanthemum stamp, some Iridescent Shimmer embossing powder and Pyrite Gemstones. 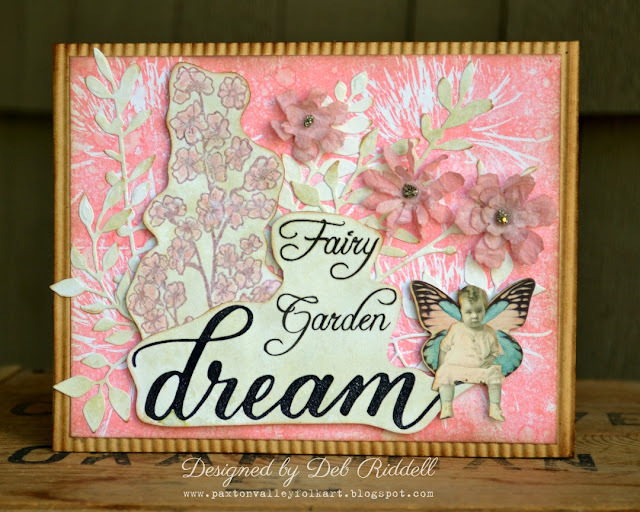 And since every fairy garden needs a fairy, Tim Holtz's Paper Dolls and Botanical Layers combined to create my fairy baby! Hope you can stop by my blog for my how to. To enter this month's Dream a Little Dream Dare, use the InLinkz below. Remember to follow the challenge rules as posted on the right sidebar of the blog, in order to be eligible. This is all about Fanstasy! We want you to unleash your imagination and show us your dreams. Have fun and check out these creations for some inspiration. My grandma implanted in me my love for nature fairies. I remember she had an old book that she read to me that had lovely poems about the year's seasons and the most adorable paintings of gnomes, flower princesses, bugs, moths, fairies and other magical creatures. So this is my version of what fairies do when they know that noone is watching. Dream a little dream of magical lands and little wonders. For this month's Dare inspiration, I went with a wee wonder... a whimsical little fairy in a sparkly magical land in the form of an ATC. 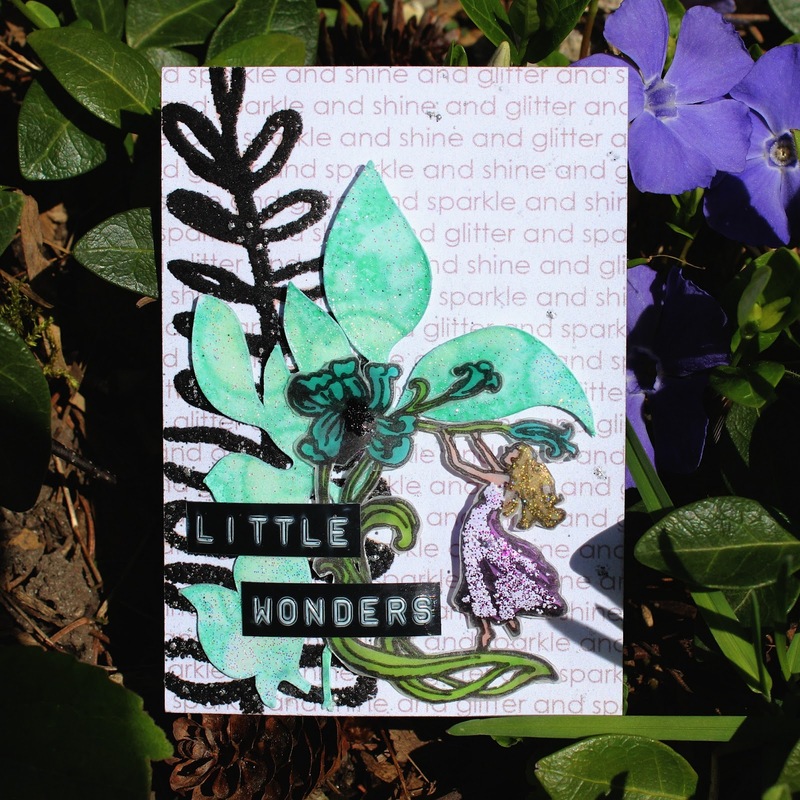 The fairy with flower stamp was stamped on vellum and coloured with a combination of emboss powders, markers, and watercolour pencil crayons prior to being fussy cut out. Pop by my blog to learn more about this little wonder. Ah, dreams--just a bit out of my comfort zone! I guess for most people they consist of fairies, unicorns, dragons and other sorts of whimsical creatures. Mine don't, so I had to "feature imagination". I just love Emerald Creek's unique embossing powders, and I used plenty on this wall hanging to bring my fairy to life. It you have time, I'd love it if you stopped by sarascloset to see all the lovely shimmer on both my fairy and my background. 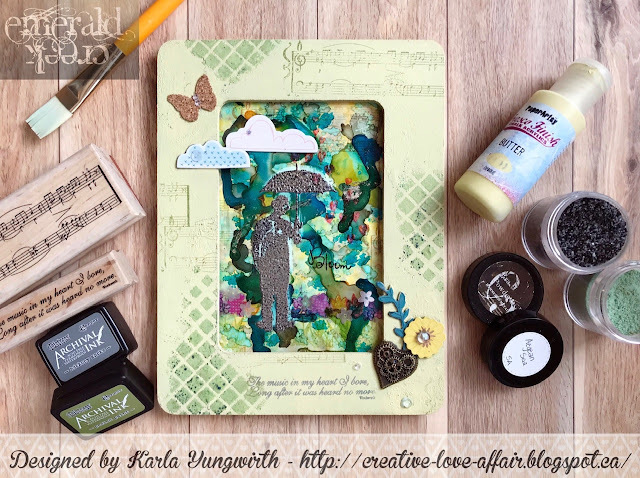 Double Duty Dare with her April Mixed Media Tag entry. 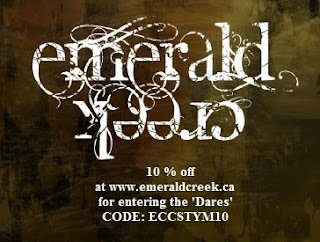 Karen please email Kim at info@emeraldcreek.ca for your prize code. To enter this month's 'Dream a little dream' Dare, use the InLinkz below. Remember to follow the challenge rules as posted on the right sidebar of the blog, in order to be eligible.